You can use salmon fillets as an alternative, in which case just increase the roasting time to 35 to 40 minutes for a 2kg salmon fillet to serve four people. Put the onion, garlic, paprika and some salt and pepper in a small blender and blitz into a paste, then transfer the contents to a bowl. Add the lemon and lime zest, parsley and olive oil and stir to combine. Spoon 2 tablespoons of the paste inside the cavity of the fish, then rub the remainder on both sides of the fish. Leave to marinate for 20 minutes. Preheat the oven to 180˚C/gas mark 4. Lightly grease a roasting tray with olive oil. 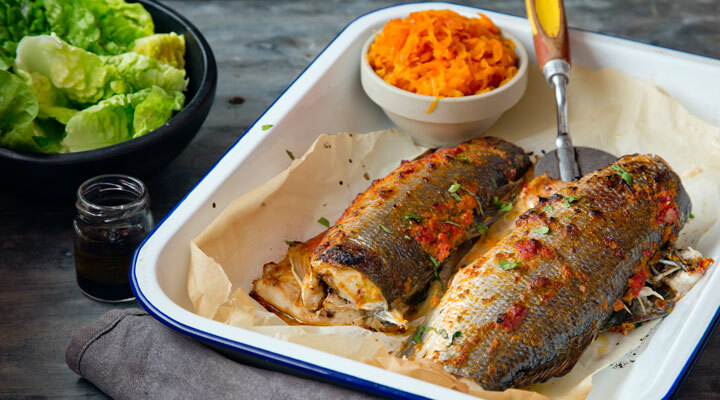 Place the fish on the greased tray and roast in the oven for 15 to 20 minutes, until just cooked through. Meanwhile, place the carrots in a pan with the butter, white wine, honey, ginger and seasoning. Simmer over a medium heat with the lid on for 5 to 8 minutes, until tender. Stir frequently so the carrots don’t burn. To make the dressing, whisk the extra virgin olive oil and balsamic vinegar together in a small bowl and season with a pinch of salt and pepper. Remove the fish from the oven and serve immediately with the lettuce drizzled with the balsamic dressing and the glazed carrots. You could also serve this with some boiled baby potatoes if desired.